STAINLESS STEEL CASE WITH A STAINLESS STEEL MESH BRACELET. FIXED STAINLESS STEEL BEZEL. BLACK DIAL WITH GLOBE DESIGN SILVER-TONE HANDS AND STICK HOUR MARKERS. MINUTE MARKERS. 24 HOUR MARKINGS. WORLD TIME CITIES AROUND THE OUTER RIM. DIAL TYPE: ANALOG. LUMINESCENT HANDS AND MARKERS. DATE DISPLAY BETWEEN 4 AND 5 O’CLOCK POSITIONS. CHRONOGRAPH – THREE SUB-DIALS DISPLAYING: 60 SECOND, 30 MINUTE AND 12 HOUR. AUTOMATIC MOVEMENT WITH 70 HOUR POWER RESERVE. SCRATCH RESISTANT SAPPHIRE CRYSTAL. PULL / PUSH CROWN. SOLID CASE BACK. CASE DIAMETER: 46 MM. CASE THICKNESS: 15.4 MM. ROUND CASE SHAPE. FOLD OVER WITH SAFETY RELEASE CLASP. WATER RESISTANT AT 100 METERS / 330 FEET. FUNCTIONS: CHRONOGRAPH, DATE, HOUR, MINUTE, SECOND. LUXURY WATCH STYLE. WATCH LABEL: SWISS MADE. 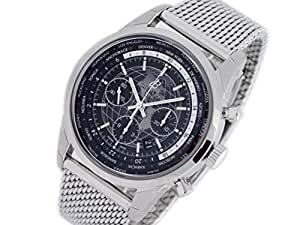 BREITLING TRANSOCEAN CHRONO UNITIME AB0510U4/BE84-152A MENS WATCH. COMES WITH GIFT BOX AND 2 YEAR PWJ STORE WARRANTY. *PLEASE NOTE THAT THE PRODUCTION YEAR OF THE LISTED WATCH IS AN ESTIMATION ONLY*. BUY WITH CONFIDENCE KNOWING EACH TIMEPIECE GOES THROUGH THE SAME RIGOROUS 31-POINT INSPECTION. REST ASSURED ONLY AUTHENTIC PARTS STRAIGHT FROM THE MANUFACTURER ARE USED. THE CERTIFIED PRE-OWNED PROGRAM ON AMAZON ENSURES PEACE OF MIND AND TRANSPARENCY VIA STANDARDIZED REPORTS AND A 1 YEAR WARRANTY PROVIDED BY WATCHFACTS.